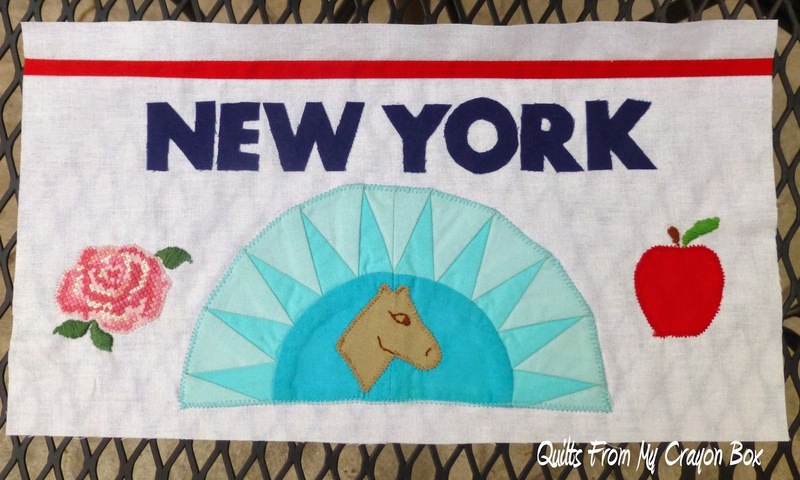 Because many of you have asked for it, here is my little bit of instructions of how I made my New York license plate block for the American Made Brand Blog Tour. I started by making the NY Beauty Block. I followed this tutorial by Kim of My Go-Go Life however I reduced the foundation pattern until it measured 7" wide by 3 1/2" tall and I did not add the outer arch but instead used a lightweight fusible to adhere it to the #1 White background and then stitched around the outside to secure it. For the inside half circle and the spikes I used colors #32 Light Aqua, #33 Aqua and #34 Dark Aqua. I will warn you...sewing the inside quarter circles to the paper pieced section wasn't so easy since it is so small but if you go very slowly and continually adjust it as you sew, it will work. 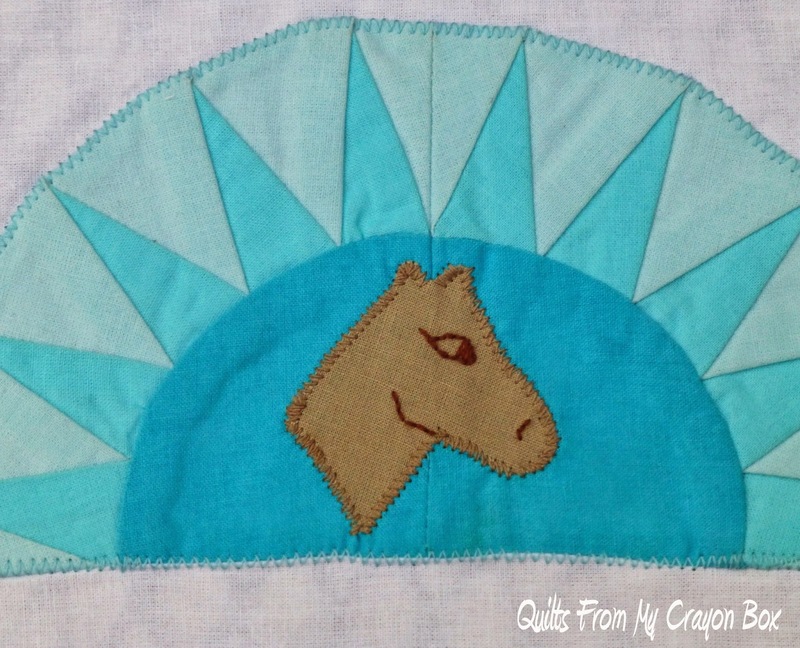 For the horse head I printed this pattern and used the smallest size and color #64 Light Caramel. The horses features were freehand embroidered with DMC #898. 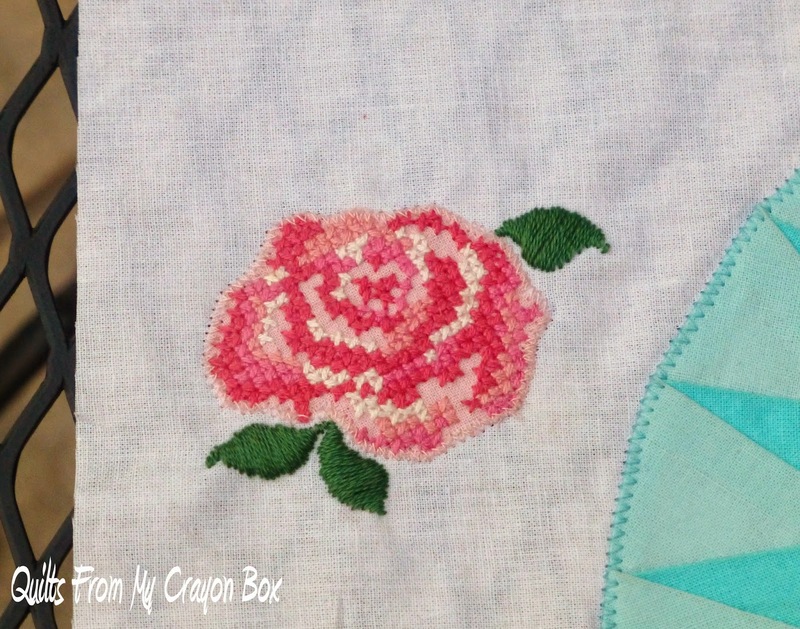 For the cross stitched Rose, I followed this pattern and used DMC floss #s 776, 3326, 335 and White on the #41 Light Pink fabric and did not cross stitch the lightest pink of the pattern but instead let the pink fabric shine through in those areas. Again I then fused it to the background fabric and stitched around the outside to secure it. The satin stitched embroidered leaves were done freehand with DMC #367. 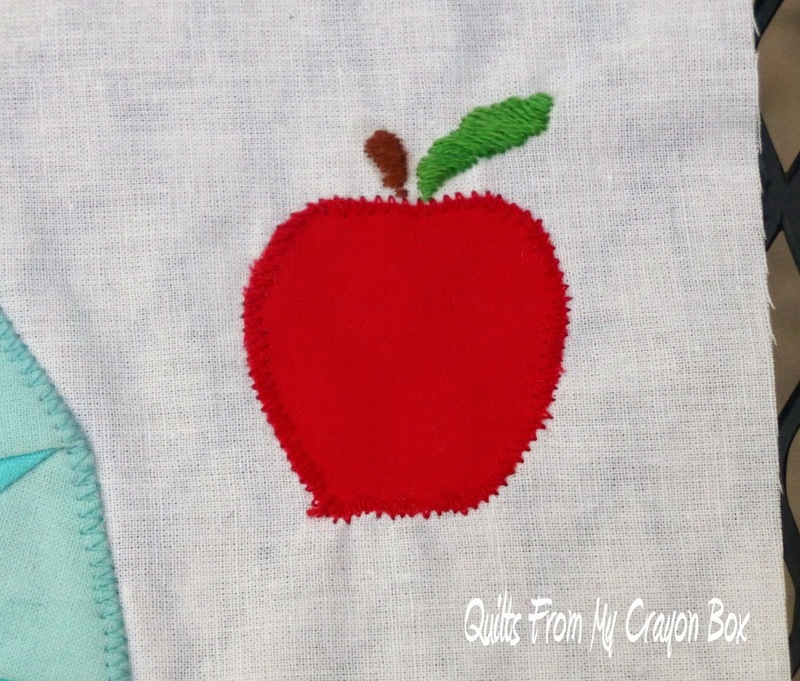 Next came the apple and I used this pattern and the #81 Dark Tomato fabric. It was simply fused to the background, stitched around the outside and the stem and leaf was then freehand satin stitched with DMC floss #s 702 and 898. The letters for New York were cut from the #93 Light Navy fabric. I printed off each letter pattern I needed from this page and then reduced them down until they were 1 1/8" high. They are fused to the background 1/4"' above the NY Beauty Block. Finally I cut off the White background fabric 5/8" above the letters, attached a 1/2" strip of the #81 Dark Tomato fabric and then added back the rest of the White strip that I had cut off and trimmed the entire block to the required 6 1/2" x 12 1/2". If you make your own version, I'd love to see it. This project truly was a pleasure for me to do and afforded me the opportunity to try some new things. I look forward to much more paper piecing projects in my future. Are all the blocks going up there to be sewn together into a quilt? It turned out so well too. I enjoy reading each and every comment that you share. And isn't that what it is all about....sharing. 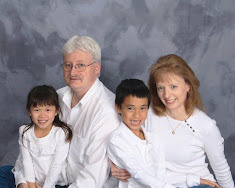 Michele.....Quilter, Pattern Designer, Firefighter's wife, Gardener, sometimes Scrapbooker and Mom to Jammer and Sunshine. Penelope is gunna get all fancied up! This blog and all of its contents is Copyright (c) 2009-2019 by Michele Kuhns of Crayon Box Quilt Studio. All rights reserved. Please do not copy any posts, all or in part, or any pictures without my express written consent. 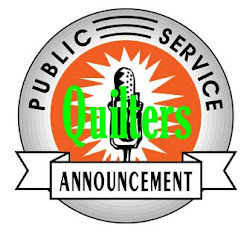 Hands2Help 2019 - Quilt Updates by Non-Bloggers!